The development of fine motor skills is essential for our survival. 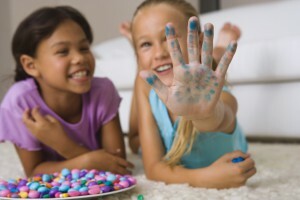 During childhood we develop more fine motor skills, more quickly than any other time in our life. Unfortunately, some skills can be overwhelming and not every child has the same level of ability when learning such things as writing or typing or playing the guitar. Fortunately, there is help. The Finger Fitness exercises presented on this site and in our book and videos are ideal for developing fine motor skills by increasing the strength, coordination and dexterity of the fingers. Plus, they’re fun and easy to do. Kids love them! Childhood is a very active time in our lives, especially for our hands. This generation of children is especially active with the increasing use of computers and Gameboys. With the increasing demands put on a child’s hands, many of the hand problems doctors and therapists saw in their middle aged or elderly patients are now occurring in patients in their 20s and 30s. As a way of preventing that try getting your hands in top physical condition as a child or young adult by using the Finger Fitness program and other products on this site. The products are all fun and easy to incorporate into your everyday life. Recover Quicker From Hand Injuries! If your child has suffer from a hand or finger injury and you are looking for the right product to help in their recovery you have come to the right place. The rehab products on our site have been selected because they are easy to use. We also have the right product to help the injured hand or finger not only regain it’s strength and coordination but increase it as well. Your child should be able to return to their everyday activities sooner than without any assistance. The following two videos are excerpts from “The Complete Hand Workout” DVD. Try following along with dance #2 to get an understanding of the fun teaching technique used throughout the Finger Fitness DVD.